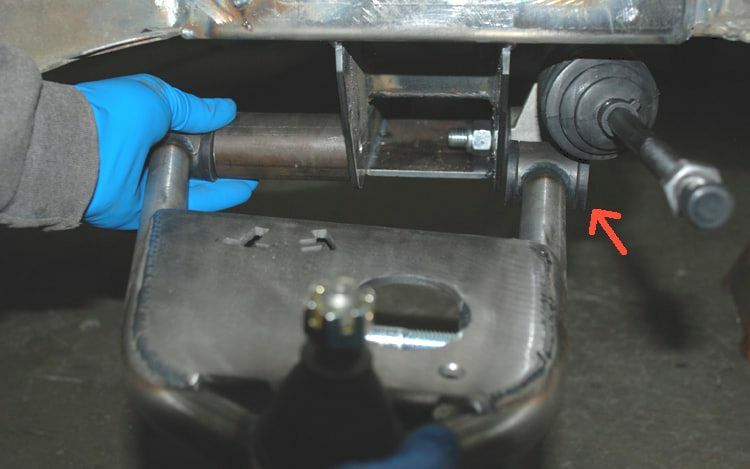 Solve the Ford Oil-Pan Clearance Nightmare Once and for All!! just $279.95/pair or as part of our Complete Hub-to-Hub Kit. Black Powder Coat - add $60 per pair; Chrome Plate - Call. Call 970-255-8890 to order. 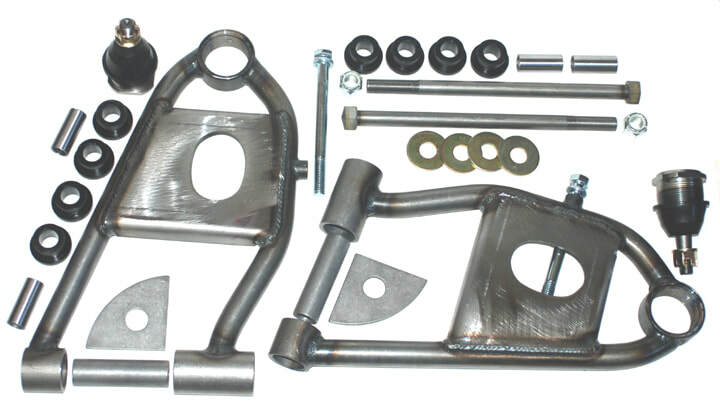 Most aftermarket Mustang II IFS lower control arms attach in front of the crossmember (arrow at far left). The arm won't fit unless the rack is spaced forward. 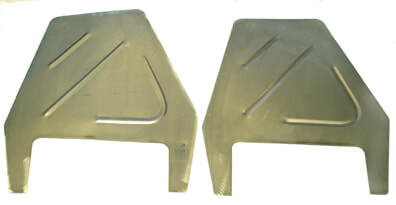 But forward spacing creates clearance problems with Ford engine oil pans. Full Tilt's new design (left) eliminates the problem by fitting the forward arm inside the crossmember. And it retains the strength and stability of the strutless design! 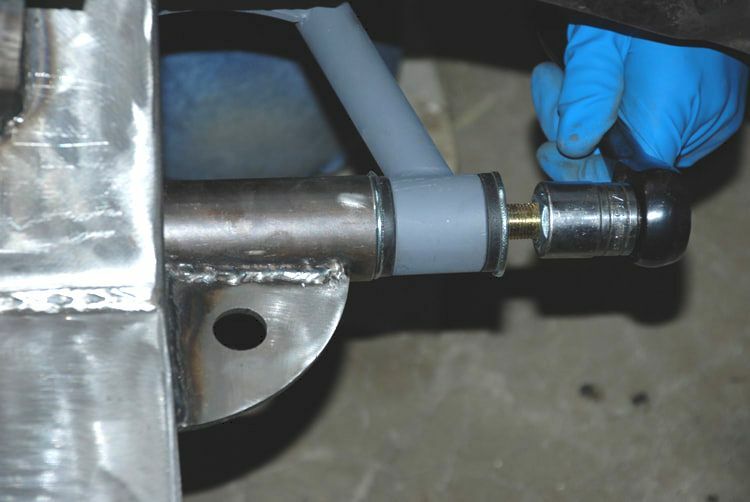 The rack can then be bolted to the front of the crossmember. 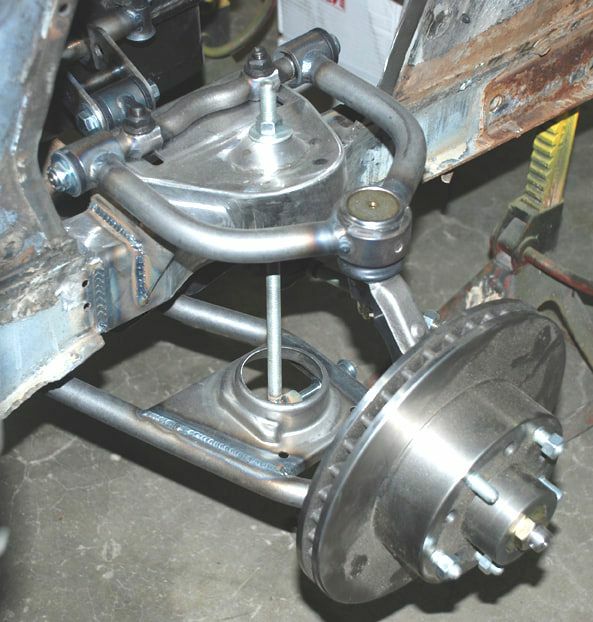 Our NEW Ford-into-Ford Lower Control Arms solve the clearance issues with Ford engines' oil-pans in Mustang II IFS swaps. 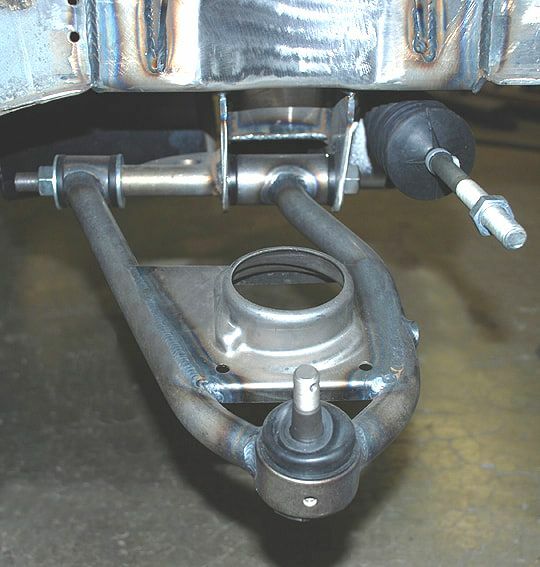 They fit ANY aftermarket Mustang II IFS crossmember and are available by the pair or as part of our complete Hub-to-Hub kits. Click HERE for details! 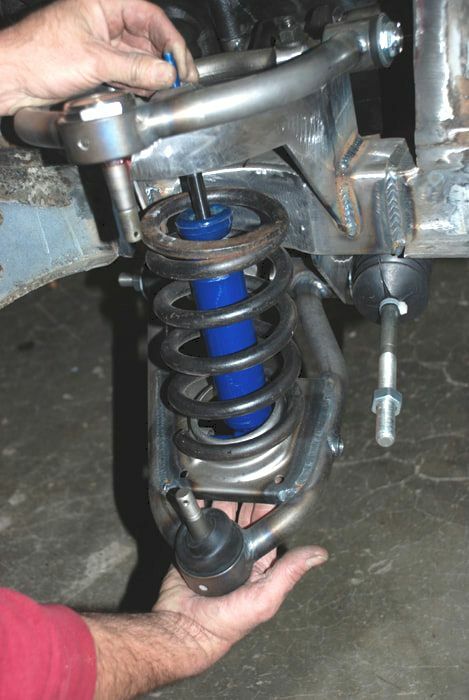 Now available for use with coilovers, Shock Waves, coil springs, and air bag applications. Our spacer block uses a heavy-duty gusset to provide maximum strength and stability without the need for strut rods or braces. 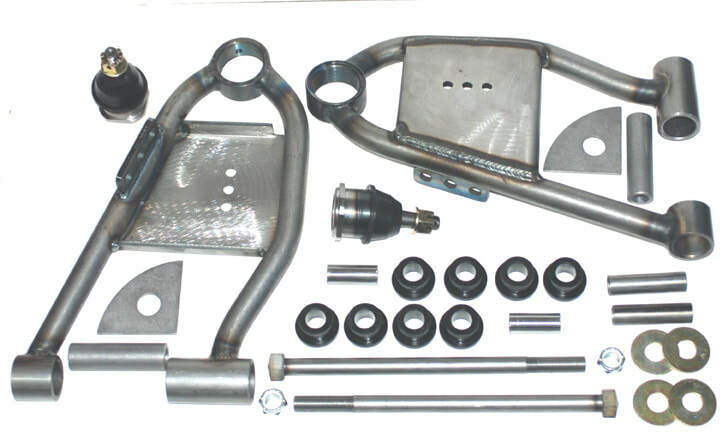 ​Check Full Tilt's complete HUB-to-HUB MUSTANG II IFS FRONT SUSPENSION kits that include lower and upper control arms HERE. 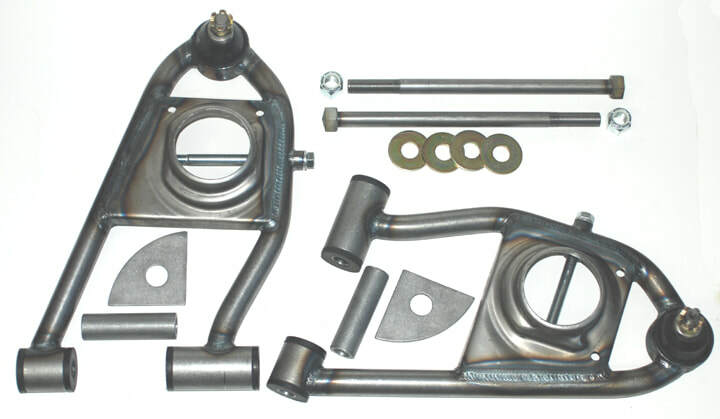 Ford-into-Ford Lower Control Arms are availble for coil springs, coilovers and air bags - same low price: just $279.95 or as part of our Complete Hub-to-Hub Kit. Black Powder Coat - add $60 per pair; Chrome Plate - Call. Call 970-255-8890 to order. Click HERE for complete Hub-to-Hub information, applications and looow prices.